The third annual SportAccord World Mind Games are taking place December 12-18 in Beijing, China. Click here for latest go competition winner results, here for Ranka Online’s full coverage and here for reports on all 2013 SportAccord World Mind Games competitions (chess, go, bridge, Chinese Chess & draughts). CLICK HERE TO WATCH GAMES LIVE! NOTE: At 9 pm EST (6p PST) on Sunday, December 15, Michael Redmond 9P and E-Journal Managing Editor Chris Garlock will provide live audio commentary on KGS on Round 4 games from the World Mind Games. 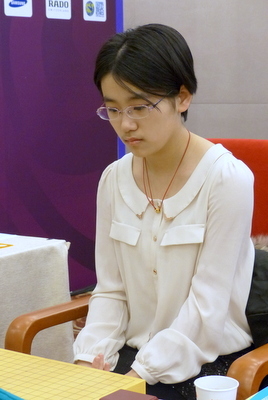 Yu Zhiying Clinches Medal in Women’s Individual Tourney: How does men’s go differ from women’s go? Aside from superficial matters such as the players’ average height, some have pointed to a temperamental difference: women tend to play more impetuously–to start a fight at the drop of a hat; men tend to play more patiently, laying deep strategic plans that only slowly mature into victory, sometimes with little or no fighting at all. Others find men’s go more coldly logical and women’s go more ‘human’. Womanly qualities were on full display in the centerpiece game in the fourth round of women’s individual competition at the SportAccord World Mind Games on December 14th. The two players, China’s Wang Chenxing and Yu Zhiying (right), the last remaining undefeated duo, came out fighting to kill from the word ‘go’. Black (Ms Wang) laid out a loose group on the left side. White (Ms Yu) immediately surrounded it, with lethal intent. Black, with equally lethal intent, cut off and attacked some of the surrounding white stones. White defended them by attacking an adjacent black group, and so it went, both players carefully pondering their moves, with the life of their stones at stake. And then this battle royal had a heartwarming ‘human’ outcome. Every single threatened group lived. Peace descended on the board, the pace of play quickened, and in the end Yu Zhiying won by 5.5 points (click here to see the Michael Redmond’s game commentary), ensuring a berth in the final, one win away from a gold medal, and assured of at least the silver. - James Davies, Ranka; click here for the rest of his report on the Women’s Individual competition. Men’s team tournament (third round): China 3-0 over Japan: Fan Tingyu beat Fujita Akihiko, Zhou Ruiyang beat Hirata Tomoya, Wang Xi beat Tsuruta Kazushi; Korea 3-0 over Europe: Park Jeonghwan beat Fan Hui, Kim Jiseok beat Ilya Shikshin, Cho Hanseung beat Pavol Lisy; Chinese Taipei 3-0 over North America: Chou Chun-hsun beat Huiren Yang, Wang Yuan-jyun beat Daniel Daehyuk Ko, Lin Chun-yen beat Yongfei Ge (Redmond Commentary). Women’s individual tournament (fourth round): Yu Zhiying (China) beat Wang Chenxing (China), Park Jieun (Korea) beat Oh Jeonga (Korea), Chang Cheng-ping (Chinese Taipei) beat Joanne Missingham (Chinese Taipei), Svetlana Shikshina (Russia) beat Natalia Kovaleva (Russia). 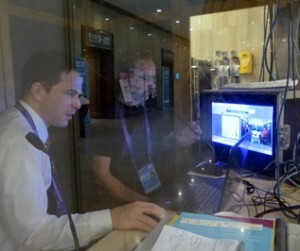 Redmond Audio Game Commentaries Now Available: This year, in addition to the various video feeds made available by SportAccord, Michael Redmond 9P (at left in photo) and American Go E-Journal Managing Editor Chris Garlock (at right) are doing live audio game commentaries on KGS, some of which are also being posted on KGS Plus under Recent Lectures. “12/14/13 9:52″ is the commentary on the Men’s Team Round 3 game between Yongfei Ge 6D and Chun-yen Lin 9P (starts at 6:53); “12/14/13 8:56″ is the commentary on the Women’s Individual Round 4 game between Yu Zhiying and Wang ChengXing (starts 3:43). Benjamin Teuber on Playing Michael Redmond 9P and Studying in China: The promising young German Benjamin Teuber 6D took on Michael Redmond 9P in a special exhibition match held Saturday morning. 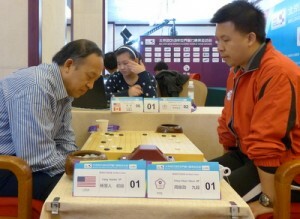 South African Victor Chow (‘RoseDuke’), the winner of the SAWMG 2013 Pandanet tournament, was originally slated to play, but Teuber (at left in photo) — who’s currently studying go in China — substituted at the last minute when Chow was unable to attend. The game was calm with Teuber playing a very solid opening, but when he failed to use his thickness to attack, he slowly but surely fell behind. In the Ranka interview, Teuber talks about the new go training program being held in China for top European players and playing soccer with Gu Li. Draughted In: Why Zhao Hanqing Changed Games: Once a fervent go player, 19-year-old Zhao Hanqing (right) began to study international draughts in 2008 and has already secured victory in the World Championship (Junior Girls). She is currently taking part in the draughts competition at the SportAccord World Mind Games being held in Beijing. Find out more about why she switched games and how China is promoting mind games. Going to the Max: As games wrap up each day in the playing room at the Sport Accord World Mind Games venue in the Beijing International Conference Center, the review room next door fills up with players, pros and fans who review their games while keeping an eye on monitors showing the games still being played. The rapid clicking of go stones competes with the excited swirl of languages from around the world. Eventually, as darkness falls outside, the game room will empty, the day’s results will be marked on the scoreboard, and even the most hard-core players will tear themselves away from the go boards. For now. Until tomorrow, when the cycle begins again.